آهنگری, کاوه, ظهیری, مسعود, منصورزاده, سید محمد, عجم زاده, حامد. (1396). تحلیل برگشتی داده‏های نشست‏ سنجی در حین حفاری تونل در محیط‌های شهری (مطالعه موردی: خط 6 متروی تهران). پژوهشنامه حمل و نقل, 14(3), 56-79. کاوه آهنگری; مسعود ظهیری; سید محمد منصورزاده; حامد عجم زاده. "تحلیل برگشتی داده‏های نشست‏ سنجی در حین حفاری تونل در محیط‌های شهری (مطالعه موردی: خط 6 متروی تهران)". پژوهشنامه حمل و نقل, 14, 3, 1396, 56-79. آهنگری, کاوه, ظهیری, مسعود, منصورزاده, سید محمد, عجم زاده, حامد. (1396). 'تحلیل برگشتی داده‏های نشست‏ سنجی در حین حفاری تونل در محیط‌های شهری (مطالعه موردی: خط 6 متروی تهران)', پژوهشنامه حمل و نقل, 14(3), pp. 56-79. آهنگری, کاوه, ظهیری, مسعود, منصورزاده, سید محمد, عجم زاده, حامد. تحلیل برگشتی داده‏های نشست‏ سنجی در حین حفاری تونل در محیط‌های شهری (مطالعه موردی: خط 6 متروی تهران). پژوهشنامه حمل و نقل, 1396; 14(3): 56-79. پیش­بینی و کنترل نشست در مناطق شهری هم از لحاظ ایمنی و هم از نقطه نظر اقتصادی از اهمیت قابل توجهی برخوردار است. مسیر خط 6 متروی تهران از محدوده میدان کوهسار در انتهای خیابان کوهسارشمالی واقع در شمال غرب تهران آغاز می شود و نهایتاً در جنوب تهران به پایانه دولت آباد منتهی می گردد. بخش شمالی تونل خط 6 مترو تهران بصورت سنتی با استفاده از روش NATM حفاری می شود. در جریان اجرای تونل خط 6 متروی تهران سیستم ابزاردقیق و رفتارسنجی نسبتاً کاملی پیاده شده و داده های آن پردازش شده است. با توجه به اینکه اطلاعات ژئوتکنیکی با استفاده از تست­های آزمایشگاهی و برجا به دست می آید و اکثرا موقعیت­های انجام تست در مسیر پروژ دارای فاصله می باشد، ممکن است فاکتورهای مختلفی از قبیل ناهمگنی­های موضعی در لایه های زیرین و یا تغییر خاک بین دو موقعیت مختلف بر روی پارامترهای ژئوتکنیکی تاثیر گذار باشد. یکی از بهترین روش های ارزیابی این پارامترها در مقیاس توده زمین، انجام تحلیل برگشتی بر اساس نتایج ابزار دقیق است. در این مقاله با مدل‏سازی مراحل حفاری تونل با نرم‏‏افزار عددی اجزا محدود PLAXIS2D و انجام تحلیل برگشتی، به تخمبن پارامترهای محتمل زمین پرداخته شده است. به‏منظور انجام این تحلیل، تاثیر پارامترهای مختلف از قبیل چسبندگی خاک، زاویه اصطکاک داخلی، میزان آزادسازی تنش قبل از نصب سیستم نگهداری و مدول الاستیسیته خاک مورد بررسی قرار گرفت. بر اساس آنالیز حساسیت انجام یافته مشاهده گردید که از بین پارامترهای ژئوتکنیکی، دو پارامتر مدول الاستیسیته و زاویه اصطکاک داخلی خاک دارای بیشترین تأثیر بر روی نشست سطح زمین می‏باشند. به طوریکه با تغییر زاویه اصطکاک داخلی از 24 تا 40 درجه میزان جابجایی ها از 3/51 تا 7/14 میلیمتر تغییر کرد. همچنین تغییر مدول الاستیسیته در بازه بین 75 تا 215 مگاپاسکال نیز باعث تغییر جابجایی بین 2/23 تا 8 میلیمتر شد. لذا با تغییر این پارامترها در 9 مقطع مختلف در مسیر تونل نشست‏های حاصل از مدلسازی عددی با نشست‏های ثبت شده به وسیله ابزاردقیق تدقیق شدند. نتایج به دست آمده نشان می‏دهد که مدول الاستیسیته خاک با ضریب افزایشی 1 الی 2 در مدلسازی عددی نتایج مناسبی را ارائه می دهد. زاویه اصطکاک داخلی خاک نیز در محدوده 37 تا 40 درجه متغیر می باشد. 2Ph.D., Student, Department of Mining Engineering, Islamic Azad University, Science and Research Branch, Tehran, Iran. 4M.Sc., Grad., AIC Consulting Engineers, Tehran, Iran. Prediction and control of settlement have great importance both in terms of safety and economic point of view on urban area. Tehran subway- line 6 starts from Kouhsar square in the end of north Kouhsar Boulevard placed in north-west of Tehran and ends in Dolat-abad terminal at south of Tehran. North part of line 6 excavated using NATM method. Monitoring and instrumentation system are well equipped and their data have been processed during excavation. Although geotechnical parameter obtained from laboratory and in-situ tests and on the other hand there are distances from sample location to tunnel route, it is possible that different factors such as local heterogeneities in layers or variation of soil between two positions affect the geotechnical parameters. One of the best methods to evaluate these parameters in large scale is back analysis based on instrumentation results. In this paper numerical modeling are done with Plaxis2D software and using back analysis, geotechnical parameters estimated. Different parameters such as cohesion, angle of friction, elastic modules investigated. Also, stresses relaxation were examined before support installation. Based on sensitivity analysis, elastic modules and friction angle have the most influence on ground surface settlement. For example, changes of the friction angle from 24 to 40 will change settlement from 51.3 to 14.7. Also, changes of elastic modules from 75 to 215 will change settlement from 23.2 to 8. Based on these finding, changes of these two parameters in 9 different sections on tunnel route were verified settlement in numerical method with instrumentation settlement. Result shows that increase elastic modulus in numerical models about two times provide good result. Friction angle changes between 37 to 40. Aghamalian, M. (2006), “Inverse Analysis of Monitoring Data during Multi-Stage Construction of Resalat Twin Tunnels in Tehran”, M.S.Thesis, School of Civil Engineering-University of Tehran. 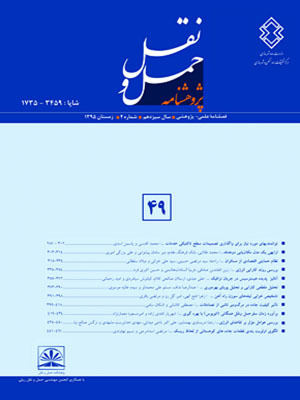 -Asadollahpour, E., Rahmannejad, R., Asghari, A., Abdollahipour, A. (2014), “Back analysis of closure parameters of Panet equation and Burger׳s model of Babolak water tunnel conveyance”, International Journal of Rock Mechanics and Mining Sciences, Volume 68, June 2014, pp. 159-166. -Bassiri Tehrani, A. A. (2001), “Inverse Analysis of Tunnel Lining with Minimum of Sum of square Value Method with one Urban Tunnel Case Study”, M.S. Thesis, School of Civil Engineering of University of Tehran. -Chenyang Zhao, Arash Alimardani Lavasan, Thomas Barciaga, Veselin Zarev, Maria Datcheva, Tom Schanz, (2015), “Model validation and calibration via back analysis for mechanized tunnel simulations – The Western Scheldt tunnelcase”, Computers and Geotechnics, Volume 69, September 2015, pp. 601-614. -Farzaneh, O., Vahdani, S. and Zand, A. G. (2001), “Instrumentation Design and Analysis of Monitoring Data in a Urban Tunneling Project”, 5th Tunnel Confrence. (­Edited by T.Kawamoto), PP. 47-61. -ITA working Group on General Approaches to the design of tunnels (1998), “Guideline for the design of Tunnels”, Tunneling and Underground space technology, Vol. 3. PP. 149-237. -Janin, J.P., Dias, D., Emeriault, F., Kastner, R., Le Bissonnais, H., Guilloux, A. (2015), “Numerical back-analysis of the southern Toulon tunnel measurements: A comparison of 3D and 2D approaches”, Engineering Geology, Volume 195, 10 September, pp. 42-52.
back-analysisstudy”, Computers and Geotechnics, Volume 68, July, pp. 38-53. -Moreira, N., Miranda, T., Pinheiro, M., Fernandes, P., Dias, D., Costa, L., Sena-Cruz, J. (2013), “Back analysis of geomechanical parameters in underground works using an Evolution Strategy algorithm”, Tunnelling and Underground Space Technology, Volume 33, January 2013, pp. 143–158. -Sakurai, S. (1993), “Back Analysis in Rock Engineering Comprehensive Rock Engineering”, Vol. 4, PP. 543- 568. -Salehi, D. and Fakhimi, A.A. (2002), “Using Inverse Analysis for Estimating Soil Parameters in Resalat Tunnel Project”, 6th Tunnel Confrence. -Zand, A. (1999), “Instrumentation Design and Analysis of Monitoring Data in a Urban Tunneling Project”, M.S. Thesis, School of Civil Engineering -University of Tehran.